Cortázar’s drive for new modes of expression suggests that he was firmly invested in transforming history by putting his literature into dialogue with the future. Like Benjamin’s description of artistic development, Cortázar’s art embodies a point of entry that aims for its own future disappearance. Cortázar foresees a time when his radical aesthetic will recede as an outmoded strategy for the coming always-already transformed world. Yet, in the process, he will have helped that very future to emerge. It is as though Cortázar felt that his role as an intellectual itself would eventually become an untenable role. Over time, he suggested that his earlier emphasis on purely philosophical, metaphysical, and fantastical forms of writing did not address the pressing political issues that consumed him later in life (Interview, 51). Cortázar placed a distinct emphasis on the need for perfected craft, resistance to rational thought, revolutionary form that defied the confines of political dogma or mimetic representation, and a symbolic solidarity for the collective experience that belonged to Latin America. Several of these empahses distinctly emerge within the story,“Las Babas del Diablo,” which literally translates into English as “the tears of the devil,” but was later translated into English with the title “Blow-Up.” It was first published in 1959, the year of the Cuban Revolution. The protagonist of the story is a French-Chilean translator named Roberto Michel, who takes photos along the docks of the Seine one afternoon. The character is an intellectual and expatriate living in Paris with a South American identity, sharing all of these traits in common with Julio Cortázar, himself. Cortázar lived in Paris starting in 1951, at first by choice, but eventually he was consigned to live there due to censorship of his writings in the 1970s by the right-wing military junta in his home, Argentina. He often described the nature of his expatriatism as a form of self-exile. Within the story, the protagonist’s romantic conception of the significance of his photographs as artistic mementos explodes when he reproduces and enlarges the images to view them in detail back at his home. He then bears witness to an irrational embodimet of violence emitted by the images and the photographic medium imposes itself on his consciousness, erasing the naïve, innocent mental images he had preserved in his memory. Through this story, Cortázar critiques the untenable status of bourgeois subjectivity in the face of violence. By the end of the story, a transformation from man into machine results in his isolated subjective impotence, with the protagonists’ consciousness remaining locked inside the mechanistic perceptions of his camera. Though the story was written almost sixty years ago, it remains filled with relevant links to our own time in which forms of visual communication have proliferated extensively through the internet and social media and they constantly inform our own framework of bourgeois subjectivity. The transformation into mechanistic thinking creates a kind of allegory for the bourgeois subjectivity in which an already limited purview is increasingly apprehended through technology to heighten the arbitrary objectivity of the gaze. The narrator undergoes a loss of control as a producer of his own experience, sacrificing his lived-memories to the dictation of a machine. The story subjects the narrator to the consequences of his own “indifference of form towards content” that Georg Lukaks attribtues to the bourgeois “contemplative stance” in his critique of the subjectivity described within Immanuel Kant’s Critique of Pure Reason (126). Such a bourgeois subjectivity implies a “reified structure of consciousness”—one that hides or suppresses social relations that constitute the material economic base by conceiving of the world as a product of the mind, rather than something independent of the knowing subject (110-111). This form of consciousness produces reason that is purely formal and partial in its ability to account for the relationship between the thinking subject and the world’s objectivity (119). In many ways, the embodiment of multiple subjectivities within the narrative of his story serves to produce an awareness of both the bourgeois and the mechanical subjectivities, as each one comparatively defines the other in terms of their contrasting limitations. These limitations are revealed when Cortázar’s character undergoes his transformation, and they point to an independent objectivity that cannot fully be captured by the purview of either. In Blow-Up, Cortázar appeals to the photographic process to produce shock through its mechanical production of objective violence in the minds of his bourgeois protagonists. These objects appear as a result of momentary lapses in a contemplative, detached stance, which expose violence as a social reality. The horrifying shock the images produce in the minds of his protagonist results in the symbolic dismantling of his bourgeois subjective stance, meant to be shared by the reader. In his imbedded critique, Cortázar depicts the collapse of bourgeois representational control, which gives way to objective historic testimony, through the impersonal lens of the machine, or camera. The beginning narration of Blow-Up introduces a binary between his human narrative and the different forms of mechanical mediation that play a role in the narrator’s life. Cortázar destabilizes the narrative voice by introducing slippage between the use of first and third person narration. The narrator expresses his lackadaisical wish for the machine to take over in writing the story, so he wouldn’t have to do the work: “[if] the typewriter [would] continue by itself (because I use the machine), that would be perfection” (114). He then enters into a meditative interior monologue on the other machine that has significance for the story—the camera: “the aperture which must be counted also as a machine (of another sort, a Contax 1.1.2) and it is possible that one machine may know more about another machine than I, you, she—the blond—the clouds” (115). This discussion of the interplay of machines and their mediation of reality aligns the impressions in “Blow-Up” with Walter Benjamin’s analysis on the way mechanic reproducibility reveals the “developmental tendencies of art under the present conditions of production” in his essay, The Work of Art in the Age of Mechanical Reproducibility. Benjamin suggests that changes in forms of artistic production make the dialectic comprehensible (218). Cortázar’s incorporation of machines in his text similarly forms a dialectic that shapes the story—a metamorphosis that takes place from the narration’s primarily bourgeois subjectivity to a purely mechanical subjectivity itself serves as a kind of allegory for historic shifts that technology imposes on our subjectivity, and our emerging awareness of such a shift. Michel knew that the photographer always worked as a permutation of his personal way of seeing the world as other than the camera insidiously imposed upon it (now a large cloud is going by, almost black), but he lacked no confidence in himself, knowing that he had only to go out without the Contax to recover the keynote of distraction, the sight without a frame around it, light with out the diaphragm aperture or 1/250 sec (117-118). Cortázar highlights the way that frames and apertures significantly transform one’s experience by molding limitless experience into a particular habit of mind. Roberto Michel is held captive by the mechanistic procedure involved in using the camera even though periodically, he escapes that mode of thinking: “I was able to sit quietly on the railing over looking the river watching the red and black motorboats passing below without it occurring to me to think photographically of the scenes” (118). Thinking “photographically” forces him to actively dictate the meaning of the world according to his specialization, but at times he lapses into periods of disengaged observation. The narrator recalls how Roberto Michel noticed a couple on his walk that day. The woman was older; the boy was young and looked nervous. The narrator points out a difference in the way he is able to remember each of them. He remembers the boy’s body better as a photographed image, while he remembers the woman’s body better as a memory. This distinction reasserts the mediating effect of the mechanical process on his memory, which destabilizes the authority of both his memory and the photograph. It is uncertain whether the photograph or his memory represents the original. Each records deceptively viable impressions of the truth. In retrospect, the narrator recalls how he assumes that his sensibility produced the sensation of mysterious beauty he felt when witnessing the couple. His subjective gaze had been divorced from any sense that the objects themselves could have any bearing on his thoughts. The narrator states: “Strange how the scene (almost nothing: two figures there mismatched in their youth) was taking on a disquieting aura. I thought it was I imposing it, and that my photo, if I shot it, would reconstitute things in their true stupidity” (122). This foreshadows that the story will later reveal a more precise discontinuity between his lived impressions and the “reconsituted” reality. Once he develops the photo, the scene goes on to conform to a completely different frame of reality than what he remembers. Roberto Michel begins taking photographs and he speculates about how the pair’s night will end up, assuming the woman is a call girl: “But that woman invited speculation, perhaps giving clues enough for the fantasy to hit the bullseye” (124). The couple notices him and the woman confronts him, but he resists her plea for him to hand over his film by arguing that it is his right to take photos in public. The boy runs off and a man waiting in a car approaches. Roberto Michel walks away from them. This is how the narrator remembers the scene. He navigates through what he considers a harmless interaction and he opts out of further engagement with the people he photographed. And what I had imagined earlier was much less horrible than the reality, that woman, who was not there by herself, she was not caressing or propositioning or encouraging for her own pleasure [. . .] The real boss was waiting there, smiling petulantly, already certain of his business; he was not the first to send a woman in vanguard, to bring him the prisoners manacled with flowers (129). Recognizing the alternate reality outside his limited understanding, Roberto Michel witnesses the violent situation that the image contains and he can do nothing but watch it with mechanical fixity: “to be only the lens of my camera, something fixed, rigid, incapable of intervention. It was horrible, their mocking me, deciding it before my impotent eye” (130). The impotence he feels causes Roberto Michel to have a shocking physical reaction; he screams. At this point, his narrative transforms from the purview of a thinking bourgeois subject into the alien mechanical lens-view of the situation. His close proximity to the scene blots out the imagery. What seems to have taken place is a murder, perhaps his own, but the depiction is vague and indeterminate. After this, the narrator shuts his eyes to the scene. When he opens his eyes, he remains stuck in the lens-view perspective of the camera and the camera has fallen to the ground. The earlier parenthetical descriptions of the sky that interrupted the story return without parentheses as if the Roberto Michel, the photographer transformed completely into the eye/I of his machine, the camera: “Now there’s a big white cloud, as on all these days, all this untellable time” (131). The emphasis in this story hinges on the characters’ impotent estrangement from action, the inhuman foreignness of machine-consciousness, and his metaphysical isolation. In essence, Cortázar likens bourgeois consciousness to its metaphysical reduplication of mechanistic thinking. His character suddenly embodies the impotent relation to history that a machine has, in that it is an unconscious and arbitrary recorder. The result of this transformation is the narrator’s complete loss of agency. The story portrays the irrational nightmare of bourgeois consciousness achieving the completion of its trajectory in the specialization of thought processes from a photographic specialist, fully crossing over to becoming a photographic machine, itself. Interestingly, Michelangelo Antonioni drew from Cortázar’s story, Las Babas del Diablo in his movie enititled Blow-Up. Antonioni’s rendering has a completely different emphasis than Cortázar’s story and he takes many artistic liberties that depart from a close rendering of the story. In the movie, the protagonist is not an amateur photographer/translator, but a professional fashion photographer in 1960s London. The movie highlights sexual promiscuity and the violent crime that appears in the photographs causes the protagonist to engage with the blown-up photo as a flaneur-detective, rather than undergoing a metamorphosis. The story never regresses into a horrific portrayal of bourgeois consciousness, but instead promotes the bourgeois character’s idiosyncratic lifestyle as a space of surrealistic, visual and textual play, keeping a few of the story’s premises, but changing the underlying message of the story altogether. The story Blow-up uses the photographic medium as a means for exposing the reader to the oppositional forces present within a dialectic conception of reality. Through photographic process, the protagonist witnesses the total reversibility of his assumptions about the world. It undermines his authority and the authority of their worldview altogether. The bourgeois subjectivity that grounds him in the beginning of the story completely unravels by the end. It is no longer a viable framework of understanding to embody the diversely oppositional worlds the story introduces. Photography serves as the narrative tool to symbolically slice reality from its context and place it within a newly established frame. A long-time reader of Walter Benjamin, it is easy to trace a line of influence from Cortazar to the theorist. For Benjamin, photography “penetrates deeply into its [reality’s] web” (Work of Art, 233). In Cortázar’s portrayal, this exposed web is violent and otherwise not penetrable by the countenance of his bourgeois subject. 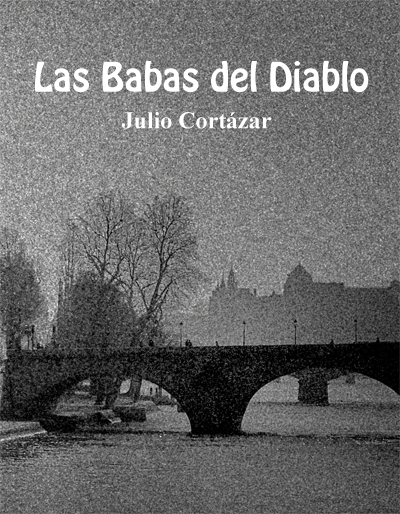 Furthermore, the type of violence portrayed in “Las Babas” takes place among strangers. The protagonist neither sympathizes with the people who produce the violence, and he does not understand what the purpose or nature of the violent action is. The violence becomes visibly distorted, the closer he gets to it, “an instant still in perfect focus, and then all of him a lump that blotted out the island, the tree, and I shut my eyes, I didn’t want to see anymore, and I shut my eyes and broke into tears like an idiot” (131). Cortázar uses photography in an irrational way to exhibit the shock such violence produces for his protagonist and which only the camera can reveal to him. Likewise, Walter Benjamin noted how early film produced shock for its viewers, since they had not yet developed any sense of filmic convention. He writes: “the shock effect of film, which, like all shocks, should be cushioned by a heightened sense of mind” (238). Cortázar uses the portrayal of shock to remind readers that violence should be shocking. Benjamin writes that photography “extends our comprehension of the necessities which rule our lives” and “it manages to assure us of an immense and unexpected field of action” (Work of Art, 236). This “field of action” is a newly recognized plane of possibility, which in these stories create a circumstance that permanently alters the possibility of bourgeois subjectivity. The mechanical process explodes the protagonist’s framework of memory, and it dismantles his willful desire to ignore the assymetries his subjective gaze seeks to diminish. The shock of the moment of recognition happens as an instantaneous reversal. The bourgeois rational worldview becomes untenable because of the imposition of a more visceral, penetrating violence. In many ways, this story stands at a kind of turning point towards an intensification of Julio Cortázar’s political investment in writing literature. After the Cuban Revolution in 1959, Julio Cortázar sought to write revolutionary literature because he felt the historic necessity to do so. Cortázar often said that the Cuban Revolution awakened him to politics (Interview, 51). He did not merely seek to utilize a mimetic framework to reflect life during times of revolution. Cortázar asserts: “to write for a revolution, to write within a revolution, means to write in a revolutionary way; it doesn’t mean, as many believe, to be obliged to write about the revolution itself” (Aspects, 35). Cortázar’s goals with literature involved the rejection of Western rationalism and all of the modes of expression that he attributes to it, including literary realism. He resists what he terms “cultural fascism” through “intellectual combat, ” which is to say symbolic combat (Exile, 175). Cortázar attributes the military as the motivation for his political involvement in Latin America (Interview, 43). In spite of the limited power of writing, Cortázar expresses a certain faith in indirect influence. He took part in various politically symbolic gestures such as signing on to the second Russell Tribunal that denounced the militant infiltration of Latin American governments by North American multinational corporations as war crimes. He asserts: “And let’s think that a writer isn’t judged only by the theme of his novels or stories, but by his living presences in the heart of the community, by the fact that the total commitment of his person is an undeniable guarantee of the truth and the necessity of his work” (Aspects, 35). However, in spite of the optimism of Cortázar’s political aspirations, he was also met with some criticism: “The tension arising from his being away from Argentina and Latin America, and from the criticism of the lack of explicit social and political denunciation in his fiction.” (Pagano, 85). Though he had begun to use his status as an intellectual to align the literature and essays he wrote with revolutionary movements through symbolic solidarity in opposition to fascist governments across Latin America following the Cuban Revolution, for some, his gesture was still not direct enough. His critics continue to interpret his work based on his earlier and more well-known experimental works that have an emphasis on metaphysical and surrealistic representation and that drew heaviliy from Borges as their predecessor. Nevertheless, writing itself, for Cortázar, produces an affect directed at the realization of future forms by defying rational thought and endeavoring to produce revolutionary agency through an aesthetic means. Abrams, M.H. and Geoffrey Galt Harpham. “Aestheticism.” A Glossary of Literary Terms. 10th ed. Boston: Wadsworth, 2012. 3-4. Benjamin, Walter. “The Work of Art in the Age of Mechanical Reproduction.” Illuminations: Essays and Reflections. Trans. Harry Zohn. New York: Schocken, 1968. 217-251. -------------. “The Storyteller.” Illuminations: Essays and Reflections. Trans. Harry Zohn. New York: Schocken, 1968. 83-109. -------------. “The Task of the Translator.” Illuminations: Essays and Reflections. Trans. Harry Zohn. New York: Schocken, 1968. 69-82. -------------. The Arcades Project. Trans. Howard Eiland and Kevin McLaughlin. Cambridge: Harvard UP, 1999. Castro-Klarén, Sara. “Cortázar, Surrealism, and ‘Pataphysics.” Comparative Literature, Vol. 27, No. 3 (Summer, 1975), 218-236. JSTOR. Web. 22 March 2012. Cortázar, Julio. “Blow-Up.” Blow-Up and Other Stories. Trans. Paul Blackburn. New York: Pantheon, 1967. 114-131. -------------. Interview with Jason Weiss. Writing at Risk: Interviews in Paris with Uncommon Writers. Iowa City: U of Iowa P, 1991. 39-56. -------------. “Politics and the Intellectual in Latin America.” Trans. Mary E. Davis. Books Abroad, Vol. 50, No. 3 (Summer, 1976), 533-540. JSTOR. Web. 22 March 2012. -------------. “Some Aspects of the Short Story.” Trans. Naomi Lindstrom. Review of ContemporaryFiction, Vol. 3, No. 3 (Fall 1983), 25-37. EBSCO. Web. 22 March 2012. -------------. “The Fellowship of Exile.” Alltogether Elsewhere: Writers on Exile. Ed. Marc Robinson. Trans. John Incledon. Boston: Faber and Faber, 1994. 171-178. Lukács, Georg. History and Class Consciousness: Studies in Marxist Dialectics. Trans. Rodney Livingstone. Cambridge, MIT: 1971. Translation and Power. Ed. Maria Tymoczko and Edwin Gentzler. Amherst: U of Massachusetts P, 2002. 80-98. Russek, Dan. “Verbal/Visual Braids: The Photographic Medium in the Work of Julio Cortázar.”Mosaic: A Journal for the Interdisciplinary Study of Literature. Winnipeg: Dec, 2004.Vol. 37, No. 4: 71-87. Literature Online. Web. 22 March 2012. Tcherepashenets, Nataly. Place and Displacement in the Narrative Worlds of Jorge Luis Borges and Julio Cortázar. New York: Peter Lang, 2008. You can buy Blow Up here.